Princess Anna Amalia of Prussia (9 November 1723 – 30 March 1787) was Princess-Abbess of Quedlinburg. She was one of ten surviving children of King Frederick William I of Prussia and Sophia Dorothea of Hanover. 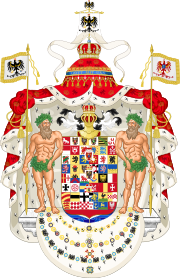 Born in Berlin, she was eleven years younger than her brother, the future Frederick II, and would have been seven years old when he made his abortive attempt to run away from home after being humiliated by his father. Both children were musically inclined, but for Anna Amalia formal musical instruction was only possible after the death of her music-hating father. Music was her secret consolation against his cruelty to her (he would often drag her across a room by the hair during his rages). Anna Amalia learned to play the harpsichord, flute, and violin, receiving her first lessons from her brother, which her more civilized mother encouraged. She was contemplated as a bride for the crown prince of Sweden along with her sister Louisa Ulrika, as her brother warned that Louisa Ülrika was perhaps too ambitious to be a good queen in a monarchy without power, as Sweden then was during the Age of Liberty. Her brother, King Frederick, said that Louisa Ulrika was "arrogant, temperamental and an intriguer", and that they should not let themselves be fooled by her friendliness towards them, while Anna Amalia was mild and "more suitable"; it has been considered, that Fredrick's judgment was given because he believed Anna Amalia would be easier to control as a Prussian agent than the more dominant Louisa Ulrika. But the Swedish representatives preferred Louisa Ulrika. Anna Amalia became the Abbess of Quedlinburg in 1755, which made her a wealthy woman. She chose to spend most of her time in Berlin, where she devoted herself to music, and became known as a musical patron and composer. As a composer she achieved a modest amount of fame and is most known for her smaller chamber works, which included trios, marches, cantatas, songs and fugues. In 1758, Anna Amalia began a serious study of musical theory and composition, engaging as her tutor Johann Philipp Kirnberger, a student of Johann Sebastian Bach. She composed chamber music, such as flute sonatas. More favorably disposed toward religious music than her brother, she set the text of Ramler's Passion cantata Der Tod Jesu ("The Death of Jesus") to music. This was her favorite among her compositions. Only a few of her works have survived. She may have destroyed many of her compositions, as she described herself as being very "timorous and self-critical." However, more compositions by her may soon surface as a result of the discovery in 2000 of the Sing-Akademie zu Berlin music archives in Kiev, a library that had been lost since World War II. Anna Amalia was also a collector of music, preserving over 600 volumes of works by notables such as Johann Sebastian Bach, George Frideric Handel, Georg Philipp Telemann, Karl Heinrich Graun and Carl Philipp Emanuel Bach, among others. Her works of curation alone represent a significant contribution to Western culture. Her library was split between East Germany and West Germany after World War II. The two collections were re-united after the German reunification in 1990. This treasury, of about 2,000 volumes, is today housed at the Staatsbibliothek zu Berlin (not to be confused with the Herzogin Anna Amalia Bibliothek, the former library of Anna Amalia of Brunswick-Wolfenbüttel). Act 1: 1. Overture. 2. 'Geängstet'. 3. 'Liebes Kind, was hast du wieder'. 4. 'Was sind all die Seligkeiten'. 5. 'Ihr solltet geniessen'. 6. 'Erwin, o schau'. 7. 'Da hätt' ich eine niedliche Kleine'. 8. 'Da kommt sie geschlichen'. 9. 'Hin ist hin'. 10. 'Ein Veilchen auf der Wiese stand'. 11. Ich muss ihn sehen'. 12 'Ein Schauspiel für Götter. Act II: 13. Entre Acte. 14 'Ihr verblühet, süsse Rosen'. 15. 'Inneres Wühlen'. 16. 'Auf dem Land und in der Stadt'. 17. 'Sie scheinen zu spielen'. 18. 'Sein ganzes Herz dahinzugeben'. 19. 'Mit vollen Atemzügen'. 20 'Sieh mich, Heilger, wie ich bin'. 21. 'Ha, sie liebt mich!' 22. 'Er ist nicht weit'. 23.' Vergib mir die Eile'. Singers: Olympia, Elmire, Bernardo, Erwin. Orchestra: 2fl, 2ob, 2hn, bn, stgs, cembalo. 75 mins. This is a chamber concerto, which could be played with a single person per part. The solo part is well integrated into the whole, and the music has an effervescent bounce. The slow movement is mainly orchestral and the finale is something of a Minuet with a Trio featuring wind solos. The origins of the Divertimento are not known, but the combination of formality and warmth at the outset suggests at least an element in common with Mozart. This is probably the first chamber work featuring a clarinet. After the tutti opening phrase, the instruments are immediately allowed a degree of individual freedom, the viola leads, the clarinet answers, the piano rounds off. This music is elegant and totally charming, unpretentious and engaging. The Ambache Ensemble, gave the UK premiere in 1995. Sonata in F for Flute & continuo; Amadeus Verlag. 18th & 19th century songs 'Inspired by Goethe'; Furore Verlag. ^ a b c Huberty, Michel; Giraud, Alain; Magdelaine, F. and B. (1989). L'Allemagne Dynastique, Tome V -- Hohenzollern-Waldeck. France: Laballery. pp. 162, 172. ISBN 2-901138-05-5. ^ Genealogie ascendante jusqu'au quatrieme degre inclusivement de tous les Rois et Princes de maisons souveraines de l'Europe actuellement vivans [Genealogy up to the fourth degree inclusive of all the Kings and Princes of sovereign houses of Europe currently living] (in French). Bourdeaux: Frederic Guillaume Birnstiel. 1768. p. 16. Wikimedia Commons has media related to Princess Anna Amalia of Prussia.